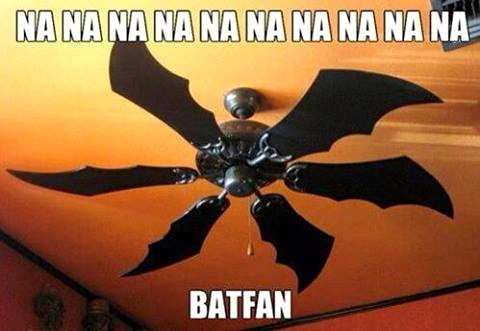 I see this as a portmanteau (of Batman and fan), but it could also be seen as an imperfect pun on Batman. The Batman theme (alluded to above) can be heard in a video in my 2012 posting “Batmaaaan”, along with a discussion of the mock chemical element Batmantium. In another posting of that year, “A batmanteau”, you can find the portmanteau batarang (Batman + boomerang). This entry was posted on August 8, 2013 at 7:58 am and is filed under Portmanteaus, Puns. You can follow any responses to this entry through the RSS 2.0 feed. You can leave a response, or trackback from your own site.